In a Nutshell: Format is devoted to helping artists create simple, stunning online portfolios that can be used as a career-building tool and a revenue stream. With e-commerce integration, Format is allowing artists to expand the function of showcasing their work. Other features, such as themes, proof delivery, and personalized blogs, allow creative professionals easy ways to connect with their clients and potential customers. What began as an online showcase for artists is now an all-encompassing platform, retaining its sleek appearance and simplicity of use. We have all heard the question, in one form or another, “What is art?” A definitive answer is difficult to nail down because every artistic creation is a unique and personal creative expression. And while art — and opinions about art — differ, many working artists face some of the same challenges. As a design student at OCAD University in Toronto, Lukas Dryja saw those challenges firsthand. Over the course of his studies, he came to realize that the majority of his peers were not sharing their work online. Lukas saw an opportunity to build a platform to help creative professionals showcase their work and talent, and so he approached his friend Tyler Rooney, a software engineer who had worked at Amazon. “We decided that there was a great opportunity to help creative professionals by developing tools to showcase their work online,” Lukas told us. The result of that partnership was Format, a platform to help artists and creatives showcase, promote, and sell work on their websites. Because Format was founded by creatives for creatives, the themes are purposeful and carefully crafted to showcase an artist’s work. Format founders Lukas Dryja, left, and Tyler Rooney wanted to give creatives a place to easily showcase and sell their work. 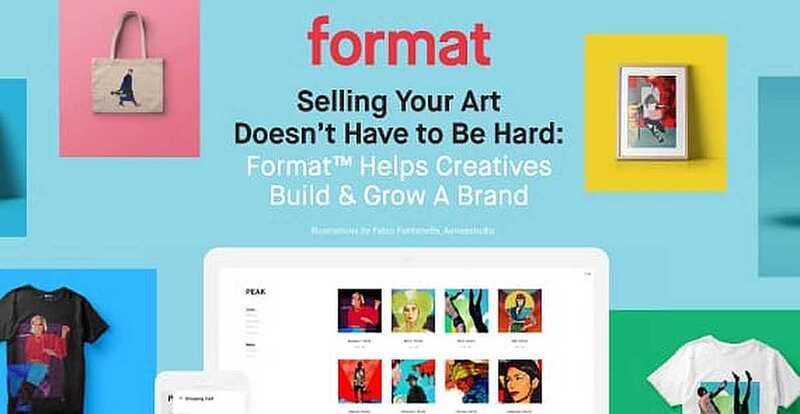 Lukas and Tyler want all creatives to live their passion, which is why Format is doing everything it can to help, including introducing an e-commerce platform that can turn a beautiful portfolio into a direct revenue stream. With Format, a user gets everything they need in one place, including traffic-boosting blog functionality and a proof delivery system for clients — and optimized it all for mobile devices. Helping creatives make a living has been Format’s mission from the start. In the beginning, this was accomplished by helping artists assemble a rich online portfolio to show potential clients. Format took that commitment to the next level by adding store functionality, allowing creatives to sell their work directly from their portfolios. The e-commerce capabilities are seamlessly integrated into the platform, meaning an artist can add a storefront to their sleek portfolio in moments. Lukas and Tyler hope stores will spur artists to create more, without having to become amateur software engineers in order to run their own websites. With a store on Format, an artist has a simple dashboard to help keep tabs on all of their products. The creations and services being sold with Format range from traditional mediums, like photography and painting, to jigsaw puzzles and elaborate headdresses. Other items are more unique, like TV magic creator Dan Hauss’ Linking Time illusion or Stephen Foster Meyer’s banana, with a joke. As with all of the products Format offers to creatives, accessibility was paramount. Lukas and Tyler didn’t want the sales platform to be just for the exclusive few; they wanted everyone to be able to share in its usefulness. Keeping track of orders and sales is also easy on the orders page in Format’s dashboard. And Format doesn’t just roll out new features on its own, it encourages users to provide guidance as to what it should develop next. Format has fostered a community feel, which means it relies on feedback from its members to help improve the quality for everyone. The philosophy Format has adopted is one of collaboration with its users. “From features to themes, every development choice is made with the help of the feedback we receive from the creative professionals using our platform,” Tyler said. The result of these improvements can be seen in the response from artists whom Format has helped. Format welcomes feedback from users to help improve its theme and layout options, among other things. Already published around the world, teenage artist David Uzochukwu uses Format to share his captivating images. Like many other artists who celebrate the benefits of building a portfolio with Format, accessibility is an important aspect of the user experience. Format answers this need with themes and optimization that are designed with mobile devices in mind. Format’s themes are designed to be clean and not take attention away from the pieces within a user’s portfolio. The goal is to have the work speak for itself by using clean lines and responsive displays. Themes are formatted for all kinds of mediums and include horizontal, vertical, tiled, fullscreen, and slideshow categories. Each is made to look just as good on a mobile device as it does on a desktop. With Format’s responsive, mobile-optimized themes, a modern portfolio can be created in minutes. Designs range from the simple, modern tiled Monocle theme to the clean, large-image Horizon theme. Each is easily customizable and can transform a website from plain to modern in moments. Format takes the focus and places it directly on the art, not the website’s interface or toolbars. While a Format portfolio can be used to show potential clients examples of an artist’s work, it can also be used to deliver that work once a job is completed. Format offers a proofing suite that allows an artist to share work with a client, and even collaborate with them during the process. The ability to use the same platform for both showcasing work and sharing it privately with clients streamlines the communication process, leaving more time for artists to focus on what they do best. From start to finish, Format wants the process to be seamless. With proofing, a Format user can send a client commissioned work directly from the platform and even get feedback. For example, photographers can share their Format portfolios with potential clients to show them what they can expect. After being hired and taking the photos, a photographer can upload them all into a private folder, add a personal watermark, and easily share the link with the client. After looking them over, the client can even mark favorites or download the photos if given permission. Permissions are controlled by the photographer and can restrict file size or the number of downloads. This gives the artist control over his or her work from beginning to end. This is another example of how Format wants the artist experience to triumph and prevail. But Format doesn’t stop there, it also aims to give artists a voice. Photos in a portfolio are often stunning, evoking emotion and powerful imagery all on their own. But many artists want to be able to make deeper connections with those viewing their work. Format blogs allow artists to accomplish that through a blog attached to their portfolio, allowing them to share their stories. Making art can be a journey, and what better way to hear about that journey than through an artist’s words. With image-based templates and an easy interface, blogs keep the Format portfolio theme while allowing users to share their inspiration and interact with admirers, clients, and customers. According to Forbes, a blog linked to a store can drive traffic, make connections, and generate conversions — among other things. And with social media integration, Format blogs help turn a portfolio or store into a living, breathing brand, complete with a personality. This interactivity and depth are what make Format so unique. As Format and the careers of those using its platform continue to innovate, the company marches toward growth. Creation is Format’s passion, and it wants creatives to be the ultimate beneficiary. An infinite number of responses exist to the question, “What is Art?” No matter the answer, chances are it can be found on a site built using Format. Adam West is the Managing Editor for CardRates.com, where he routinely corresponds with financial experts to produce the latest news and advice on topics related to helping consumers achieve greater financial literacy and improved credit. He has more than 12 years of storytelling, editing, and design experience in print and online journalism and is most knowledgeable in the areas of credit scores, financial products and services, and the banking industry.